Situated between the ever-growing metropolitan areas of Portland and Seattle, the Olympia region is emerging as a “right-sized” destination for exploring, shopping, wining and dining. Whether it’s a winter weekend for two or a festive family tradition, the area’s easy accessibility, rugged northwest beauty, affordable hotels and independently-owned shops make for an easy getaway. And we didn’t even get to the food and craft brewing scene – let’s just say it rivals each of its urban neighbors in decidedly different style. In one weekend, slurp fresh-from-the-sound oysters at 222 Market, watch lighted ships on Puget Sound and visit a quintessential small-town tree-lighting or parade. Downtown for the Holidays, Enjoy Twinklefest during the full holiday season, where downtown business reveal beautifully decorative displays that give a whole new meaning to window shopping. But of course, make sure to stop in the unique downtown shops to find the best, decidedly different, gifts for the people on your holiday list. Twinklefest displays will stay up for viewing throughout December. Tenino Christmas Tree Lighting, Friday, Dec. 1. Join for a true small-town Christmas compete with a tree lighting at 6 p.m. welcomed by the Tenino High School Choir/Band, and the Tenino Motorcycle Drill Team. Parade of Lighted Ships, Saturday, Dec. 2. 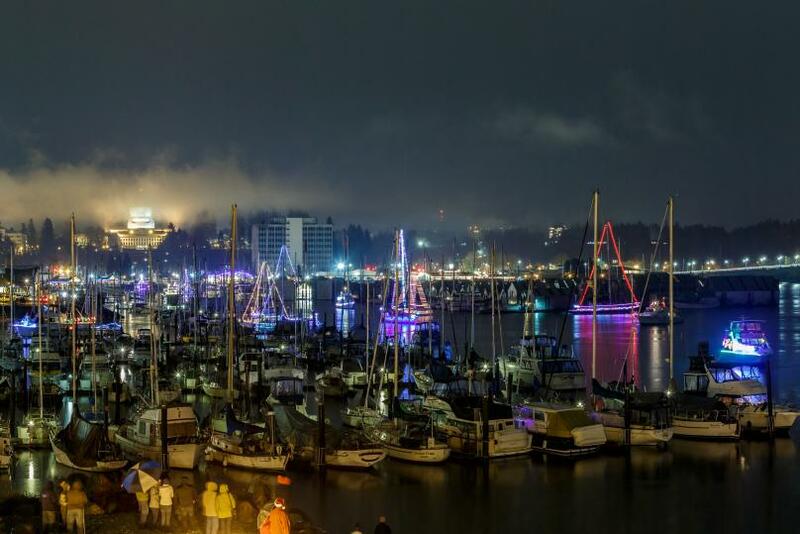 This scenic lighted ship parade begins downtown at Olympia’s Percival Landing to quaint Boston Harbor and back. Find a seat at any number of waterfront restaurants or bundle up and watch the bedecked boats from a cozy waterfront vantage point. Yelm’s Christmas in the Park, Dec. 2. Get your spot curbside in Yelm bright and early for the 9 a.m. holiday parade! Ending at Yelm City Park, the fun keeps going with hot cocoa, pictures with Santa, live entertainment and more. Lacey Lighted Vehicle Parade and Christmas Tree Lighting, Monday, Dec. 4. Lighted vehicles and floats of all kinds light up for the holidays and travel the streets of Lacey for this one-of-a-kind parade. This sparkling spectacular–which includes Lacey Fire Department&apos;s Santa Mobile featuring Santa himself–begins at Lacey Boulevard and Sleater Kinney Road at 6 p.m. and culminates at the tree-lighting ceremony in Huntamer Park. 15th Annual Tumwater Christmas Tree Lighting, Saturday, Dec. 9. Get in the spirit of a hometown holiday with the Annual Christmas Tree Lighting Festival in Tumwater. This local tradition is held from 2-5 p.m. at the Tumwater City Hall and Fire Station and features games, holiday crafts, choir performances and the lighting of the tree. Santa will arrive on an antique fire truck after the ceremonial tree lighting. Long Lake Polar Bear Plunge, Monday, Jan. 1, 2018. Leap into the new year with a refreshing dip in Lacey’s Long Lake. The fun begins at noon with campfires, music, and hot cocoa—leading up to the "plunge" at 1 p.m. Others may opt to stay warm and dry on shore and cheer on the swimmers. Hunter Family Tree Farm, open now through Dec. 23. Chop down your tree and meet Santa and his reindeer while exploring Hunter Family Tree Farm. With a stunning view of Mount Rainier, this family-owned and operated farm provides all the trimmings for a memorable family tradition. Lattin’s Country Cider Mill & Farm, warm up with award-winning apple cider while you pick out your ideal tree. Bonus, all the trees at Lattin’s are pre-cut so you never have to put your delicious cider down. Schilter Family Farm, open now through Dec. 17. Find a freshly made wreath, pick out unique holiday gifts straight from the farm and cut down your own tree on the 180-acre family-owned farm. Harlequin Production’s The Stardust Christmas Fandango! Nov. 30- Dec. 31. Enjoy this musical comedy set in 1961 at the Stardust Club where romance, music and more take shape, all during the festive holiday season of course! Studio West’s rendition of The Nutcracker, Dec. 14-18. Enjoy this classic holiday ballet at The Washington Center for the Performing Arts with a special Clara’s Winter Wonderland Party offered for the three and under set. The Nutcracker presented by Ballet Northwest, Dec. 8-10, 15-17. Set to Tchaikovsky’s classic score, this performance features over 200 dancers with beautiful costumes and set design at The Washington Center for the Performing Arts. Spend a holiday or winter weekend and find dining, lodging, events, festivals and entertainment ideas at www.experienceolympia.com. Join the conversation and make sure to share your adventures with us by tagging social posts #DecidedlyDifferent and connect with us on Facebook, Twitter (@Experience_Oly) and Instagram (@ExperienceOly).